Let’s talk about Gold as an investment. Gold is one of the most divisive asset classes on the planet. Stock-centric investors such as Warren Buffett think it’s a worthless “pet rock” that fails to appreciate in value. Gold bugs, on the other hand, revere the precious metal with an almost religious-like ferocity. Both of these views are misguided particularly when you apply them to a framework that involves TIME. The fact that Buffett accrued his great fortune during a brief period in which the financial system was based solely on fiat currency has lead him to view Gold with contempt. However, the fact remains that Gold has been a storehouse of value for 5,000 years. Based on this alone, Buffett’s ideology is myopic. To sneer at Gold is to sneer at the history of money. However, Gold Bugs are no better in that they focus too much on this “5,000 year metric.” The fact remains that since 1971, Gold has ceased to operate as a storehouse of value in the same way as it did during the other 4,962 years. I’m NOT saying Gold is no longer a storehouse of value… I’m saying that Gold no longer stores value as it did PRIOR to 1971. The reason for this concerns the fact that the world is now in a completely fiat-based financial system in which Central Banks can print tens of billions of their currencies at a whim. This opens the door to abject manipulation of Gold prices. Historically, Central Banks printed actual physical currency. That is no longer the case. Today, 99% of wealth is digital. When the Fed or some other Central Bank prints money, they are not actually firing up a printing press; instead, the entire process is digital in nature and simply involves moving electronic currency from one bank account to another. Because of this, it is much easier for Central Banks to manipulate asset classes by printing money and then using it to buy or sell futures in those assets. We know this is the case because the futures exchanges openly admit they have programs in place through which Central Banks do this. An alternative scheme involves Central Banks providing short-term loans to large investment banks, which then manipulate asset classes for them. Thanks to several recent lawsuits, we know for a fact this regularly occurs in the Gold market. For this reason, Gold no longer acts as a storehouse of value in the same way as it did during the previous 5,000 years. I’m not saying Gold doesn’t maintain purchasing power better than other investment classes, I’m merely pointing out that it no longer maintains purchasing power in the same way as it has historically. And for this reason, Gold bugs, particularly those that hold the precious metal up as a kind of religion, end up perennially frustrated (its been 40+ years since Gold acted as it is supposed to… that’s the length of an entire investment career for some). So… if Gold is NOT a “pet-rock” as the Buffett crowd would claim… and it’s NOT the storehouse of value that it one was…. What is it? 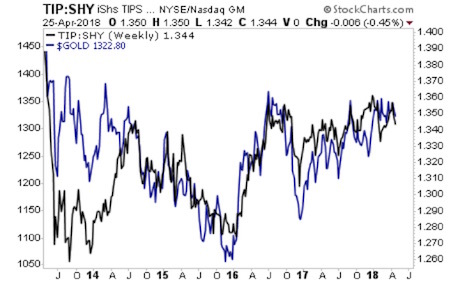 Gold is a risk asset that trades based on the true cost of moneyas illustrated by “real rates” (Treasury yields MINUS inflation protected Treasury yields). Remember, in our current financial system, the yields on US Treasuries represent the “risk free rate of return.” When you account for inflation by subtracting the yields on inflation-protected Treasury bonds from normal Treasury yields you arrive at the TRUE cost of money. THIS is what Gold tracks as the below chart reveals. Having said all of this, the signs are now pointing towards Gold and other inflation hedges rising rapidly as inflation takes hold of the financial system. 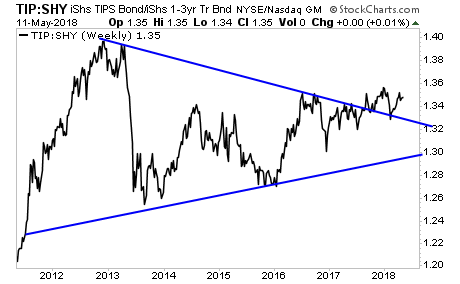 Real rates have staged a CONFIRMED breakout from a massive five year triangle pattern. This is EXTREMELY bullish. And it tells us that HIGHER real rates are coming in the future. Put simply, BIG inflation is on its way. And smart investors are already taking steps to profit from it..